Meet ‘Magic’ the newest member joining our FAB team. Magic is trapped in the mirror and is standing by to meet your guests helping them make the perfect pose through the photo shoot. Not only does the mirror look great but it provides lots and lots of fun at weddings and parties a like. To keep things exciting we can also mix up the animations and characters taking the photos throughout the hire period. 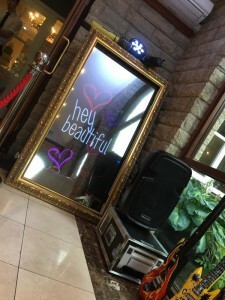 Our Magic Photo Mirror is the most amazing alternative to the more traditional photobooth and will guide guests of all ages through 4 fun photo shots and will produce instant high quality prints. Our packages include a personalised photo album where your guests can place their picture along with a written message and/or take a copy for themselves. All of the pictures taken will also be saved and handed to you on a USB stick for you to take home. Our photobooth comes installed with no-nonsense pricing and unlimited prints just select the time period you’d like the mirror for. We provide Wedding and Event Magic Mirror Hire for Shaw And Crompton and surrounding areas. For venues further a field please contact us.